Back in early Spring, gas prices in many parts of the country hit $4.50 per gallon. The Republican attack machine warned of imminent $5.00 per gallon prices which would destroy America's fragile economic recovery and push the nation back into recession. And, it was all President Obama's fault. The fact that no president can control the price of fuel didn't matter. It made for a great soundbite. So with gas prices down to an average $3.48 per gallon, with prices dropping $.15 in just the last two weeks alone, why isn't Obama, and his Democratic surrogates, taking credit for this precipitous drop in price? As Obama's GOP challenger would say, "Sauce for the goose is sauce for the gander." . The prevailing wisdom should be that, if you cause the price of gas to rise, then you also are responsible when it drops. And with just four months until the election, and with the economy still the number one concern of most voters, why the heck isn't Obama giving this speech ad nauseum:? "Several months back my opponents on the right accused me of causing gas prices to climb near $5.00 per gallon. 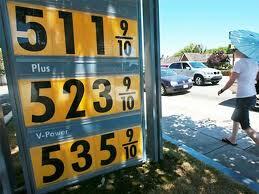 Well, under my watch, prices have now fallen below $3.50 a gallon. That's right...I've worked with my Democratic peers in Congress to help you fill your gas tanks for a third less cost. That's money that goes right back into your pockets. We did that. My opponent said you'd soon be paying five bucks a gallon. Shows you how much he knows about how to fix the economy. And that's why you should keep me as your president for another four years..."
So why are Obama and Democrats so inept at spin? Why can't their rhetoric be as effective as the GOP's? Why would they stand by and let Obama be accused of driving up gas prices and not create a media blitz when they fall? This would seem like a no-brainer. A gift-horse. Rhetoric handed to him on a silver platter. If Obama's to renew his lease for the White House this Fall he better start figuring out a simple, bumper-sticker-effective way to tout his accomplishments or he'll be handing over the keys to Romney. They don't coordinate, because they don't have a unifying, true purpose; Keeping taxes low for the very rich at all costs. I ask myself that same question all the time. He has the worst PR in the world. He is too silent when there is much change to be proud of-people need to know!